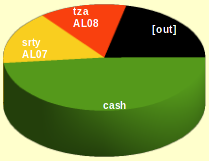 SPY rose by 0.5% this week, while my account fell 0.4%. The loss-floor is now -8.3%. Tuesday: At 3:59:57pm there was a single trade on /ES for 150,000 futures contracts (notional = $10 billion). In June there had been a huge buy and then the market went up; this time apparently a huge sell, but the market just sagged a little without a major drop. Wednesday: Ben Bernanke of the US Fed did not announce any quantitative easing. The market fell. Thursday: Mario Draghi of the ECB did not announce any quantitative easing. Immediately afterward, at 7:30am EDT, another 65,000 futures contracts on got sold on /ES (= $4.4 billion notional). The market fell. Friday: Short squeeze! Europe started rising, then the US govt announced the non-farm payroll: 165,000 new jobs (of which 429,000 were fake), then US markets opened and continued the rise. In accordance with tradition, the NFP will be treated as the “cause” of a market action that began hours earlier. SRTY: Yay! Biggest win since June. TZA: Rats! Biggest loss since May. Quote fetch&archive system: The daily replacement of Schwab quotes with Barchart quotes worked correctly Monday through Thursday, but once again failed Friday because Barchart insisted on providing two days’ worth of data when I asked for one. Maybe this is a general Friday problem? Added code to the program to delete unrequested data from Barchart. On Tuesday, Barchart said that the 10am quote for IWM was $79.12, while Schwab had said $79.27 which is 0.16% higher, so my “allow 0.1% slop” rule wouldn't have been enough. Schwab's quote was from 10:00:10am and the market moved a lot during those ten seconds. Interactive Brokers: I haven’t yet looked into how difficult it is to move an IRA account when you don’t live in the States anymore, but I did find out that InteractiveBrokers is indeed a “clearing broker” (meaning that they hold your positions in their own name, rather than using a 4th party). Their API seems to do what I need: at 12:00:03pm, I want to get the OHLV candlestick values for 11am-12pm, not the current real-time quote. Also their API allows robots to enter trailing-stop orders (unlike Schwab). This week, the market fell for four days, then made almost all of it back on Friday. 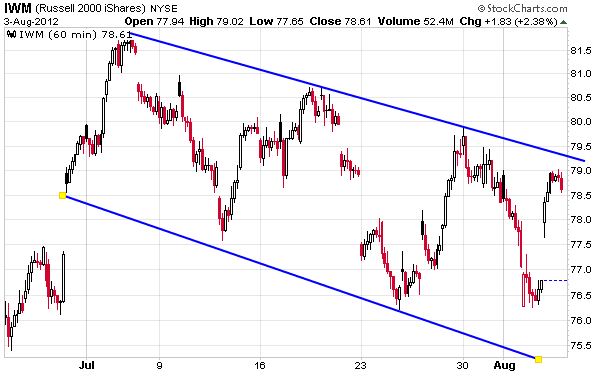 It did not fall to the bottom of the channel, instead making something of a “double bottom”. Also, it did not rise all the way to the top of the channel today. Since the market generally continues in the same direction for the Monday and Tuesday following an NFP announcement, I expect that that IWM will hover near the top of its channel for the start of next week. Alternative: gap up out of the channel, which would make sense if the intent is for SPY to return to its yearly high in March before crashing after the Olympics. Only 1.5% more to go for new highs this year! A wild week! On Monday and Tuesday, it seemed that this week would end with a “buy” signal for IAU. On Wednesday and Thursday, it seemed that this week would *not* end with a “buy”. As of Friday’s close, the weekly MACD histogram is +0.001, which is actually a minimal “buy” signal. But I didn’t buy. Let’s see how next week starts out.